This book is his will (or maybe the last will not even writing by his ancestors) by Jarl Ale of Basseville, direct descendant from king Harald I of Scandinavia and famous the Jarl Robert of Basseville of Normandy. He speaks about his childhood of his education and about his route which allowed him to have this vision of the politics, the geopolitics, the economy and the world today through his family historical heritage which has been transmitted from generation to generation. He bring to us his own vision, and he considers the moment to wake up and protect our tradition as the heart of societal values. Jarl Alexandre Alé de Basseville of Normandy, descendant of the 1st King Harald of Norway, was born in Bordeaux on July 8th, 1970, the land of Aliénor of Aquitaine. He is one of the last direct descendants of the Viking and Norman Kings’ lineage. Through his great grandfather who created the first trading company in Luxemburg in 1927, to his grandfather who managed the Caltex oil industry, Alexandre Alé de Basseville sees the important role of energy as the cornerstone for an economically strong and sustainable Europe. Born into the oil business, he is passionate about it and has built strong relationships with royal families and corporate oil leaders in the Middle East. Alexandre Alé de Basseville grew up among artists, philosophers, politicians, men and women of great influence and developed a taste for entrepreneurship. Eager for new experiences and knowledge, he carried out businesses in his own way. His passion for Arts flourished at the age of 15, when he joined the world of contemporary art and honed his skills in photography, painting, filmography and sculpture under the advice of Andy Warhol. After studying at the La Scuola di Arte in Milan, he came to know Lucchi Renato Chiesa, known as “the last surrealist.” This relationship led to great opportunities, such as being represented by an international agent, recognition from the Metropolitan Museum of New York, and work with legendary fashion and design magazines. Later, he will serve as creative director for several major French and international brands. While enjoying a successful career in the arts, he has turned to support the banking business narrowly connected to the oil business, holding a legal banking license and working in the financial sectors with interests in foreign currencies, online banking platforms, and private banking.&#8232;Alexandre Alé de Basseville has successfully brought the concept of the first entertainment fund backed by the support of AAA banking. His passion for expanding Internet commerce is associated with the first streaming company in America. NGOs and associations play an important part in his life. At the age of 19, he joined in the fight against AIDS by making art that represented the violence of AIDS. His mobilization continues today around another equally important cause: providing work and education to girls and women in emerging countries. Living with a rare genetic disease, Alexandre Alé de Basseville is disabled and understands the need to fight for the construction of special infrastructures to improve the life and integration of disabled people. Yesterday evening Carol Margaret Tetlow gave a talk about her books to the Ainderby Steeple and District branch of the Women’s Institute. What a lovely group of ladies! There might only have been about 25 present but they were a warm and receptive audience. She sold several copies of her novels and from each sale will be donating 25% to the Breast Cancer Research Foundation (www.bcrfcure.org). Together with her fee for attending, she raised £40, which was brilliant. Here’s a photo of Carol Margaret Tetlow and two ladies discussing one of her books! Since the founding in 1993 by Evelyn H. Lauder, BCRF has raised more than half a billion dollars for lifesaving research. Through a unique and streamlined grants program, they seek out the brightest minds in science and medicine and give them the necessary resources to pursue their best ideas. As a result, researchers are able to make discoveries and design new approaches to address all aspects of breast cancer—and do so in record time. In 2015-2016, BCRF will award $48.5 million in annual grants to over 240 scientists from top universities and medical institutions around the globe. In addition, $5.4 million has been committed to the international Founder’s Fund project focused on metastasis. Every hour of research they fund improves outcomes and saves lives. But they still have more to do. The thousands of women and men suffering from breast cancer today depend on the Breast Cancer Research Foundation. No institution can conquer this disease alone. Together, we can. We especially announce the books of Carol Margaret Tetlow (Out of Practice + Faith Hope and Clarity), Gary McGinnis (Good for One Ride), Judy Bruce (Voices in the Wind), Jean-Louis Riguet (Augustin. My Battle of Loigny), Opaline Allandet (Godefroy the Cruel), Louis J. Feinstein and Nancy Genovese (Swords of David) and Carlos Rubio (Forgotten Objects). While the journal has always served as a harbor for ships—foreign books—from abroad, it also functions as a lighthouse that reflects back the light it receives, for this has likewise been an essential part of our mission. From a modest seedling of 32 pages in January 1927, Books Abroad grew to 256 pages by the end of its fiftieth year (Autumn 1976), and that year’s cover design reflected the completion of a significant circle. In January 1977 the journal became known as World Literature Today, reflecting the truly international range that its coverage and reputation had acquired. 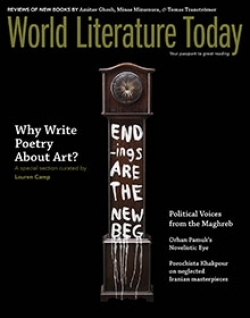 Now in our 88th year of uninterrupted publication, WLT is one of the oldest continuously published literary periodicals in the United States—along with such other publications launched in the early twentieth century as South Atlantic Quarterly (1902), Poetry (1912), and the New Yorker (1925)—and we remain devoted to our mission of serving students, scholars, and general readers worldwide. For years, a quotation from Goethe appeared on our masthead: “These journals, as they reach a wider public, will contribute most effectively to the universal world literature for which we are hoping. There can be no question, however, of nations thinking alike. The aim is simply that they shall grow aware of one another, understand one another, and, even where they may not be able to love, may at least tolerate one another.” Goethe’s words, first published in 1828, remain at the heart of our mission, even—or perhaps especially—in a world that has become increasingly globalized in the 21st century but remains fraught with national, linguistic, and political divisions. Now in its ninth decade of continuous publication, WLT has been recognized by the Nobel Prize committee as one of the “best edited and most informative literary publications” in the world. WLT has received a dozen national publishing awards in the past ten years, including the Phoenix Award for Editorial Achievement from the Council of Editors of Learned Journals in 2002.